Mustang Challenge | New Orleans Days 5-7 – Flying Burritos, Gators & Bourbon St.
Nashville has come and gone, but now we’re headed to the grandiose city of New Orleans for some Gumbo and Alligator Spotting! If Nashville was good, New Orleans was great. 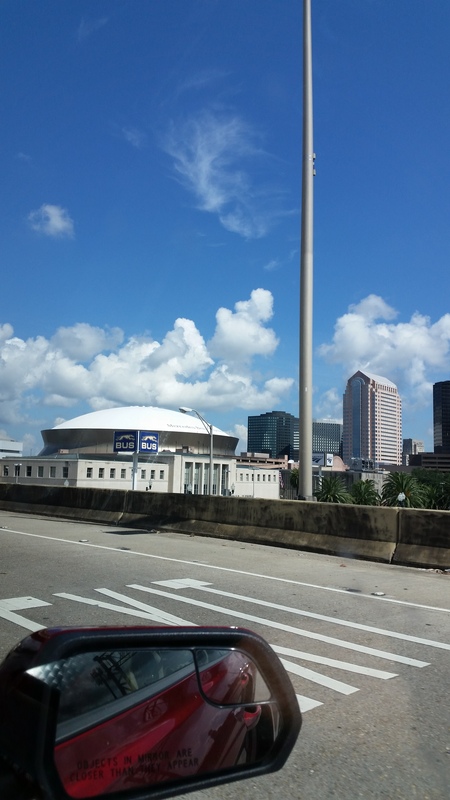 There is still plenty of physical evidence, and on quite a large scale, of the damage hurricane Katrina did many years ago, but the city is energetic and full of life, welcoming to all who choose to visit. Having booked a hostel ($17.50 a night per person, what a steal) in the lower garden district, we pulled up to the curb of the converted house at roughly 7:45PM after about 8 hours of driving. The drive itself was smooth, stopping for food and gas (twice), and one extra stop to secure the quarter panel scoop back on. 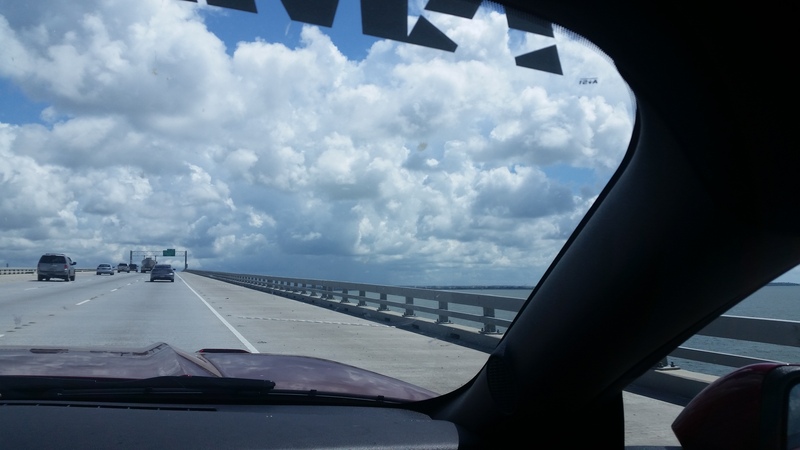 The car is fitted with aftermarket quarter panel scoops, held in place by double-sided tape, and I suppose due to the humidity and heat, the adhesive let up and the passenger side scoop started to flap about in the wind about 100 miles out of New Orleans. We rectified this by pressing it back into place and have not had the problem since. Inside the 2016 Mustang GT we’ve commandeered for this trip is relatively comfortable. There is plenty of leg room up front, and both Forster and I have agreed that the most comfortable driving position is to lean the seat back several degrees, akin to the gangster lean that occurs with Foxbody seats. Pushing 6’0 tall, having a small recline also helps with visibility, as when we have the S550 seats in a normal position, the downward slope of the roofline eclipses the top portion of our vision. The cloth seats themselves are firm and heavily contoured mid-back and at the legs to keep occupants in place when testing out the limits of the Coyote. Great for ripping around, slightly less great for long road trips, particularly the leg bolsters. I like to sprawl out on long drives and the leg bolsters impede my ability to do so. Whilst on the topic of the interior, I am neither a huge fan of the radio layout. Looks like Ford went for a fighter jet look, but there are just so many buttons. 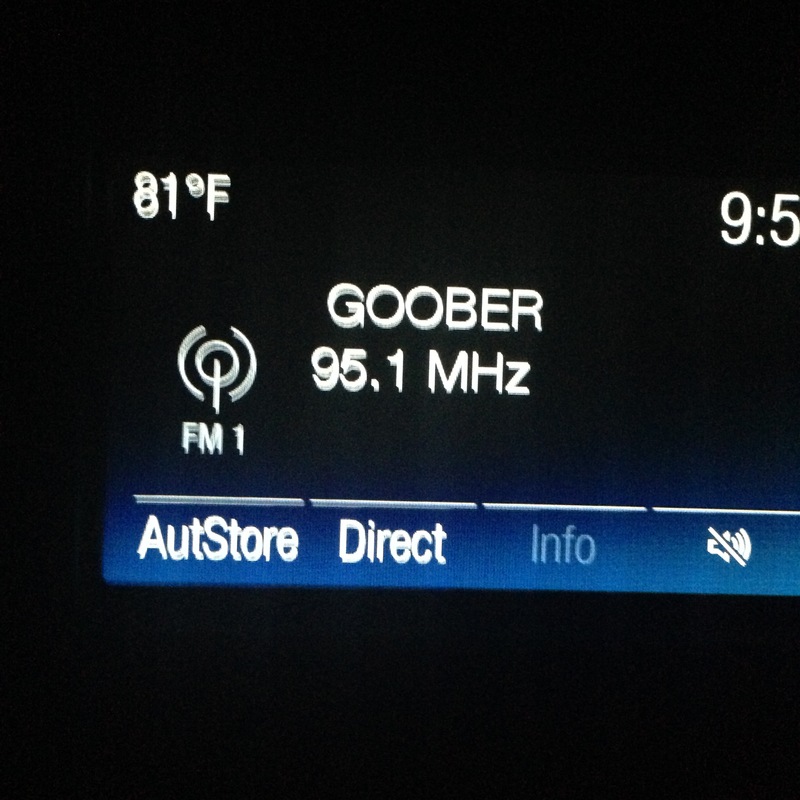 In fact, 35 buttons just for the radio and media system. Another 13 buttons finish up the climate control and traction control systems. What is most interesting is a lot of those buttons are dedicated to working a telephone (there is a full keypad on the right of the radio), but doesn’t that defy the whole purpose of Ford’s SYNC system? I thought the idea behind SYNC was to eliminate excessive buttons and encourage hands-free operation. This isn’t a major problem or anything, just a somewhat baffling inconsequential note. I’d rather play with the 435 ponies underfoot than dialing up Pokemon Go over the radio anyway. Right, back to the matters at hand. Connor, the staff member manning the hostel when we arrived (great name, great guy) greeted us and got us checked in right away. The hostel being quiet, Alex and I opted to go eat straight away and unpack later. Given a recommendation and directions from Connor, the two of us set out on foot to find a place called “Wand’s”. Finding “Wand’s” turned out to be very difficult. First off, both of us were having a hard time even remembering the name of the place we were looking for. Alex thought we were looking for a place called Mayas whilst I was looking for any restaurant that started with a W. We did find a place called Mayas, but not “Wand’s”. Confused, I called Connor back and asked him to confirm the name of the restaurant as “Wand’s”, which he did. Immediately after hanging up it occurred to me that I should have asked him to spell it out, because “Juan’s” sounds like “Wand’s”, but is written totally different. Not wanting to call a second time and give the impression that Canadians are incompetent, we pressed on looking for a place called “Wand’s” or “Juan’s”. Eventually, we reached the end of the street but did not find the phonetically matching restaurant. Stupefied, we asked some locals where “Wand’s” was. They told us “Wand’s” (or did they say “Juan’s”?) was just a few blocks back the way we came, on the opposite side of the street. More determined than ever, we set back the way we came. 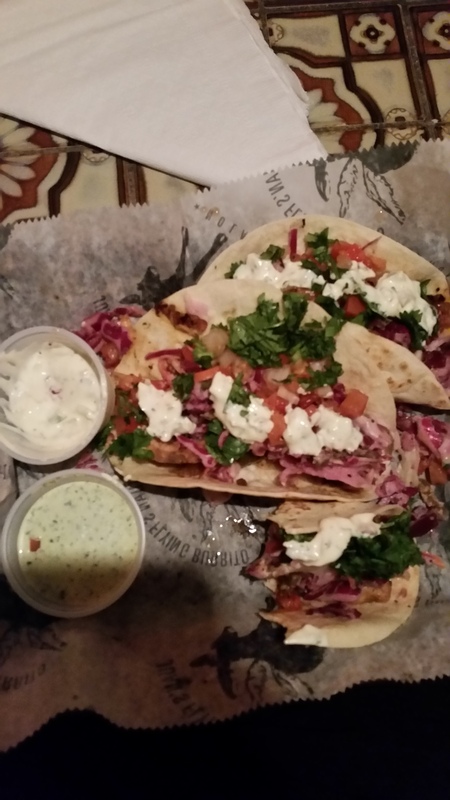 5 minutes later, we hit the jackpot – Juan’s Flying Burrito. Surely this was the place we were looking for. And the real kicker – it was perhaps the 3rd or 4th restaurant we passed from the very beginning. Unfortunately, because the two of us were on the lookout for “Wand’s” or “Mayas”, we never processed the giant sign that said: “Juan’s Flying Burrito” (but we did initially walk right underneath it). Whatever, I’m sure this isn’t the first time something like this has happened to a couple of tourists. I’m glad we preserved through the Wand-Juan ordeal, because the meal we had there was absolutely fantastic. Looking through the menu it was nearly impossible to settle on just one item – it all sounded so amazing. Finally, I selected the Flying Burrito and Alex chose the Louisana Blackened Fish tacos, with the cheapest liquor and beer available to drink (definitely a theme here…). Highly recommended to eat there for anyone in the lower garden area. The rest of the night consisted of us exploring the rest of the neighborhood, and continuing to order the cheapest whiskey and beer at each bar we stopped at. An interesting thing about New Orleans is that it is an open bottle county, meaning you can carry a drink anywhere on the street! The next day had us up bright and early, leaving the hostel at 11am to investigate the Louisiana swamps. We fired up old Ruby and blasted off to find us some gators, visions of 14-foot monsters battling to the death flashing through our heads (conditioned by all the “reality” alligator shows playing on TV these days). 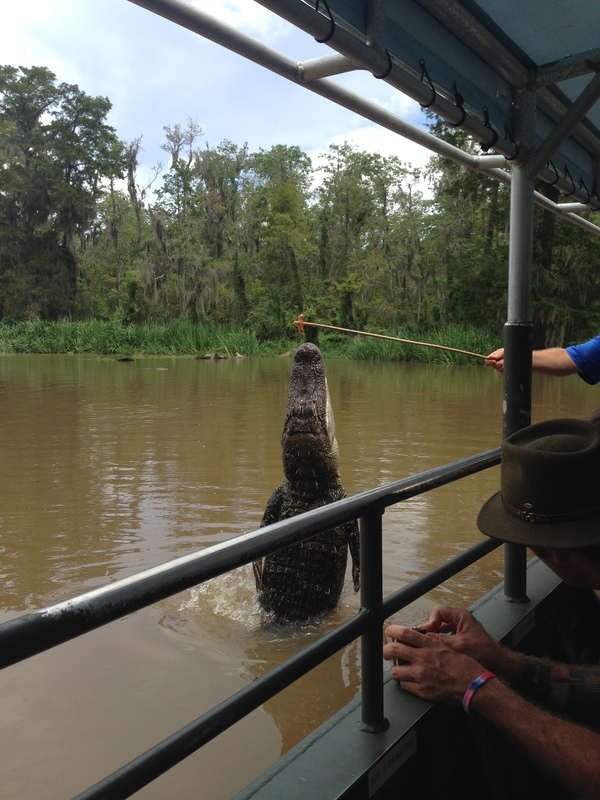 Cajun Encounters is where we ended up, and a Cajun swamp tour is what we got. Captain Bishop happily loaded about twenty of us city slickers onto his boat and we cast off. Within 20 feet of the dock, we encountered our first gator (a young ‘un), causing Capt. Bishop to ecstatically announce that the one gator spotting guarantee had been met and there would be no refunds. Throughout the next hour and three-quarters, we were subjected to many other dad jokes (what’s the difference between an alligator and a crocodile, you ask? One you see later, the other in a while. Haha, good one Cap’n) and lots of crawfish and gumbo talk. Many gators were spotted, but unfortunately, none were even close to 14 feet. The biggest we saw was only Lebron size, roughly 7 feet (estimated weight of 200 lbs). I guess those alligator shows are fake. Who would’ve thought? Severely crushed by the thought that Troy and Yob (Swamp People) are not, in fact, catching an 800lb gator every time like the camera leads us to believe, cruising the swamp was pleasant nonetheless. 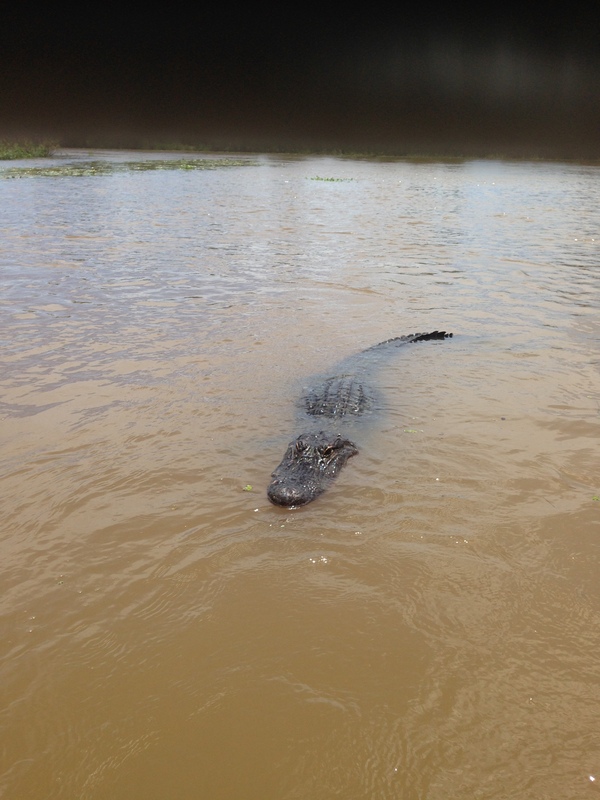 In fact, many of the gators are accustomed to the tours boats coming through and even recognize them. Most of the gators, upon seeing the boat, approached us right away. The wary gators were easily coaxed over by Captain Bishop calling to them and skipping a few marshmallows over their way. They were almost pet-like, not at all acting like the ruthless reptilians that outlived the dinosaurs. I still wouldn’t pet one, though. A solid day, surely to be followed by a solid night. Tonight would be the big night where we’d visit Bourbon street – supposedly the party central of the entire city, where patrons roam all over, drinking and dancing the entire night away. We can’t wait! Connor (the hostel staff) had recommended seeing Bourbon during the day, as at night it is pretty hectic. (Did he see our Canadian passports and assume we should be sheltered?) Unfortunately, Connor didn’t realize that chaos is exactly what we wanted to see. Leaving the Mustang behind, Alex, myself and Denise (who we met at the hostel) ordered an Uber to get there. A Silverado 1500 showed up to cart us over, and Lisa, the driver, was very happy to give us the low down on Bourbon street (“Y’all gonna see some vomit ‘n smell piss”, was the word for word description). Lucky for me, my sense of smell is awful so I never got a whiff of #2, but #1 was found in select parts of the street. A gourmet meal to kick the night off, (over)cooked by yours truly. Bourbon street is chaos, but not in a dangerous way. Akin to salmon swimming upriver for mating season, partygoers swarm every which way, a solid swirling mass of people running the length of the street. Attracted by light, sound and occasionally directed by a club promoter, venue doors are constantly swinging open and shut as the various herds subjectively seek the most promising place to let loose. If a bar or club is not your thing, no problem, as many people choose just to hang in the street, shooting the breeze and throwing back some brews. Keeping an eye on us all were mounted police (our brethren, the Mounties of the South), patrolling up and down the street, ready to intervene if any incidents were to arise (we did not witness anything exorbitantly unruly, everyone was just having a good old time). A blend of blues and jazz dominated the air, volume intense enough that those in the street were able to keep to the beat, swinging and swaying with drinks in hand. You don’t even need to enter any of the establishments to have a fun good time. Simply bring a beer with you from home and rock out to the music from the street -a great tactic for those seeking to interact with a lot of other people but don’t want to spend any money. A truly unique place, New Orleans. However, the real secret of New Orleans is a street named Frenchmen street, which I would wager would be named after the former colonizers of the region. If Bourbon street is spring break, then Frenchmen is a wedding party; music, dancing, art, food and drink all presented in a classier, more sedated atmosphere, possessing an undeniable inviting charm and mystique. Jazz, country, cajun – you can find any three of these styles being played by a live band, or if you prefer the modern mix of digital music, many of the bars are two storeys, where on the first floor a live band plays a more conventional tune and upstairs rages bass heavy EDM, catering to the bump’n’grinders. Just as the three of us reached Frenchmen street (about a 10-minute walk from Bourbon),a local jazz band spontaneously put on concert right there on the street corner; I can only guess that they knew to roll out the red carpet for us. The band itself, a loosely organized group of young males, managed to attract enough spectators to block the street, causing a backup of traffic. Oddly enough, no one honked or complained – I guess all the drivers were just as mesmerized by the performance as us on foot. Three trumpeters supported by two trombones, a tuba, a snare drum, all kept in time by a bass drum, combined fantastically to create a powerful melody, full of heart and soul, that could be heard from blocks away. Playing non-stop for at least an hour, the crowd that accumulated was incredibly large. In fact, those boys probably had more people listening to them on the street corner than did any of the bars have patrons. By far, they were best “act” of the night. All in all, New Orleans at night is a hustling and bustling place. I suppose the locals tire of the lights noise and smell, but we were enthralled by the vibrant and dynamic night culture going on there. New Orleans is definitely a place we would go back to. How Do I Add Horsepower to My V6 Mustang? Mustang Supercharger Comparison: Which is Best? How does a Mustang’s Overdrive Work?